To Ted It May Concern! September 10 Edition! SHEESH, it’s been ages since I did one of those Ted’s Mailbag dealies, isn’t it? Or posted anything, really, of substance up here other than screen-grabs from whatever I’m currently watching on Netflix, which – with the closed captioning on and still images taken out of context – are a quick way to instant hilarity, or at least reasonably quick content. What’s more I didn’t even have to bother coming up with the idea myself, instead saving even more time by stealing the concept from the blog of a pal. My my my, we do go off on tangents, don’t we? Anyway, back to today’s post, Letters From Pals or whatever we’re calling it. So here comes the mailman now – oh, pardon me – gender-neutral man – and it looks like…yes! It looks like he’s got a letter for me! What the hell’s going on with the 99¢ Only store? 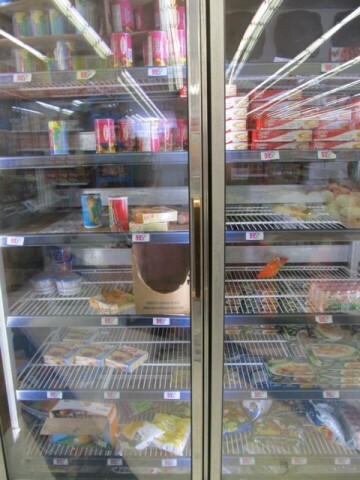 I used to be able count on their refrigerated section being chock full of frozen waffles and frozen pretzels – and now the freezer section is all but bare! How the hell am I supposed to stick to the Frozen Pretzel & Waffle Diet Plan that’s sweeping social media with neither of the staples at hand? Look, if anyone has the interest or huge swaths of free time to look into this, it’s you. Find me an answer and this half-finished coarse pretzel salt packet and near-empty bottle of cheap Pampa “maple-flavored” corn syrup from Argentina is yours! P.S. 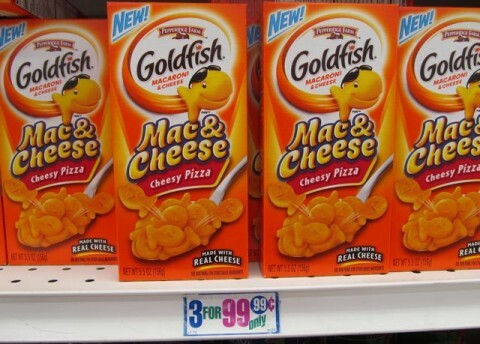 What do you think about the boxes of Goldfish macaroni and cheese they’ve been selling? My God, man, I can’t get enough of ‘em! Manna from heaven by way of Pepperidge Farm if you ask me! Yum! You know, the good thing about having, what?, six readers is that you can drop all kinds of inside jokes into your posts and at least 16.66666 percent of your audience will appreciate ‘em. I admit I hadn’t heard about this depleted frozen food inventory dilemma, so I headed over to 99¢ Only, Reseda Division, and by Godfrey, the man’s right! While the freezer section wasn’t completely empty, it was missing a number of items said pal mentioned, namely frozen pretzels & frozen waffles. I was determined to get to the bottom of this and if this meant asking the checker about it as I was paying for my groceries – and in doing so, interacting with another human being – well, so be it. Except I forgot about it by the time I was up at the registers, fixated as I was on a rare candy aisle find – a Reese’s Big Cup 2-pack that I wanted to get out to the car and cram down my gullet before it melted all over the faux naugahyde interior – so we’ll never know. However, I will say this: Both the waffles and pretzels were not likely closeout items, so they’ll probably be back. How’s that for a definitive answer? Now I believe you owe me some syrup & salt…? Oh yes – as to the Goldfish Macaroni & Cheese, which the art department will please illustrate below with some sort of photograph so we’re all on the same page here…? As you can see above, a few months ago, Pepperidge Farm Goldfish Mac & Cheese was available at the 99¢ Only store for the low, low price of 3 boxes for 99¢ only. Not a great deal for mac & cheese, but not bad, either. Pepperidge Farm Goldfish Mac & Cheese wasn’t bad…but, well, let’s say that the Kraft people shouldn’t be losing any sleep over this. The “mac” or macaroni pasta is flat, dense and goldfish-shaped giving it a particularly al lewis, or “to the tooth,” texture. What I’m saying was it was exceedingly doughy for macaroni – hell, they could have more accurately named the product Goldfish Dumplings & Cheese. But – again – three for a buck so, eh, why not? Good lord, what other possible reason could they have for continuing to lower the price?! Now, according to the Pepperidge Farm website, Goldfish Mac & Cheese is available in four flavors. Unfortunately, 99¢ Only had but two: Cheesy Pizza and Nacho Cheese. Your more traditional “Cheddar” variety was nowhere to be found. Neither was the “Butter Parmesan” flavor which, if you’re like me, and of course you are, you know sounds a lot better than reconstituted cheese powder could possibly ever hope to be, but you are nevertheless intrigued and, given the chance, would have gambled twenty bucks on a hundred boxes just in case. Despite the nacho cheese variety tasting, in the words of a pal, “atrocious,” and the cheesy pizza, “like vomit,” (or maybe I’ve got them backwards, but you get the idea), I didn’t think they were that terrible. Oh, sure, the cheese sauce was a little thin (A trick I came up with to counteract that, which I didn’t steal from another fellow blogger: eschew the milk altogether and just dump in more dollar store margarine, or as he calls it, “butter.” Ha! I stole the trick from him all right, but the guy doesn’t hardly blog anymore, so it doesn’t count), but once you dump a can of tuna in there and a handful of jalapeño slices (or maybe I’ve got them backwards – a can of jalapeño slices, a handful of tuna, who knows, but you get the idea), you can hardly tell. This is getting serious. 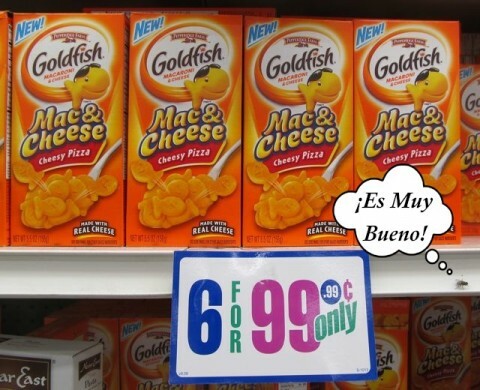 Six boxes of mac & cheese for a buck! Another pal – oh, I’ve got plenty of ’em – (and this one a real killjoy) – pointed out that for less than a dollar you could buy a pound of dry macaroni and make a decent homemade mac & cheese instead of buying this stuff 5.5 ounces at a time and then hoping for some sort of miracle when you combine it with its accompanying envelope of dehydrated whey, xanthan gum and maltodextrin, and a few handfuls of dollar store margarine. 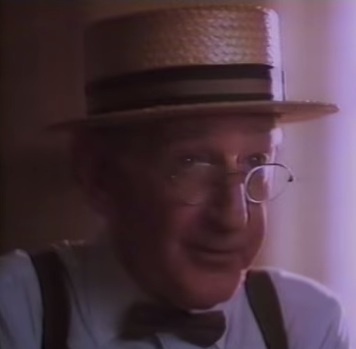 To that I say, “Feh!,” because, sure, you’ve got your macaroni, but where’s the cheese, man? Where’s the cheese? If you think you’re going to get a decent macaroni-&-cheese cheese for anything close to a buck, well, brother, I’ve got a bridge to sell you. Or if it’s not a bridge you’re looking for, I’ve got a few dozen boxes of recently expired fish-shaped macaroni & cheese. It’s not bad, but it’s an acquired taste. Step right up! One crisp dollar bill will get you not one but two boxes – because if you think I’m taking a loss on this crap, I’ve got a bridge to sell you. Update! While the 99¢ Only locations I go to have finally depleted their expiring inventory – or possibly buried them in a landfill in Alamogordo, New Mexico – a pal tells me that the 99¢ Only store near him was recently offering an unprecedented TEN boxes for a dollar which amount to – pardon while I get out my calculator – which amounts to approximately one shiny Roosevelt dime per box (if my figures are correct). Of course I called him a filthy liar, but as he’s also the same pal who sent in the original letter whose unbelievable tale of disappearing waffles and pretzels turned out to be largely accurate, we’ll take him at his word. So head to the 99¢ Only store in Hollywood, pull nine boxes off the shelf, bring them to the counter, hand the checker a dollar and tell her to put them in one of those 10¢ paper bags they’re making us pay for in LA now; and once home, dump everything in a boiling cauldron – bag, boxes, receipt – the whole schmear, and for the outlaying of exactly one lousy buck, you’ve got dinner and everything you need for a night of papier-mâché arts & crafts with the kids. Posted by Ted on September 10, 2014, 5:26 PM.